On this page you will find products for crowd control, retractable barriers, cordoning. We provide leading Swedish industries such as SCA, Swedavia, ICA with high our quality barrier products. Our crowd control products are used in the toughest industrial environments where only the best products are good enough. We grant a 3 years guarantee on our products functionality. 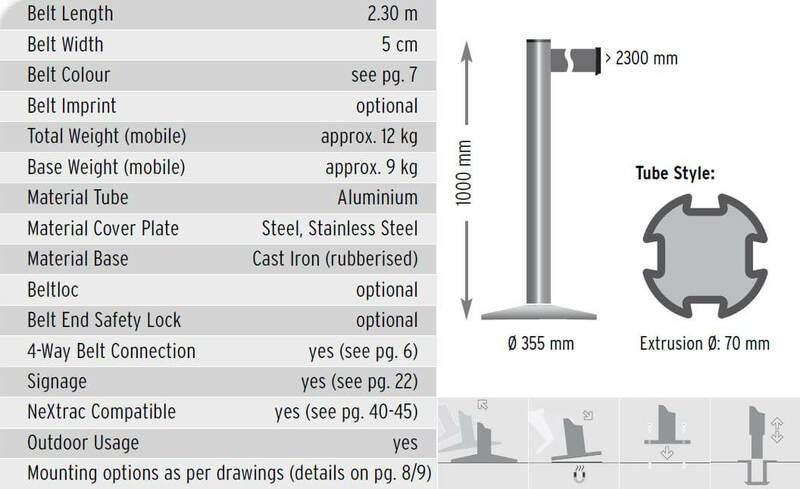 For those who need a post with a heavier foot (19kg) we've developed Beltrac Robust. Compared to its counterpart with standard foot Beltrac Classic which weighs 12kg. The post is equipped with a retractable belt of 2,3 meters. We offer a complete range of tradional and modern solutions for crowd control and cordoning. You can even chat with one of our colleagues in livechat on the bottom of this page. Click on the chat-window to start your session. A big selection - We have one the largest selection of barrier products in the country. Fast delivery - delivery time of 1-3 days for products we have in stock. 1-5 years warranty for the entire range of products. 3 years functional warranty for all Beltrac products. Large servicecenter and workshop - We offer service on all Beltrac barrier products. Every belt mechanism gets it´s own unique batch number at production. Parts are therefore easy to identify in case you need spare parts. © 2019 Snelder Gruppen. All Rights Reserved.